Located in Breckenridge, this 5,300 square-foot fulltime residence features four bedrooms and five bathrooms. While mountain homes frequently incorporate wood in the décor, this home exemplifies how to take the material to another level. 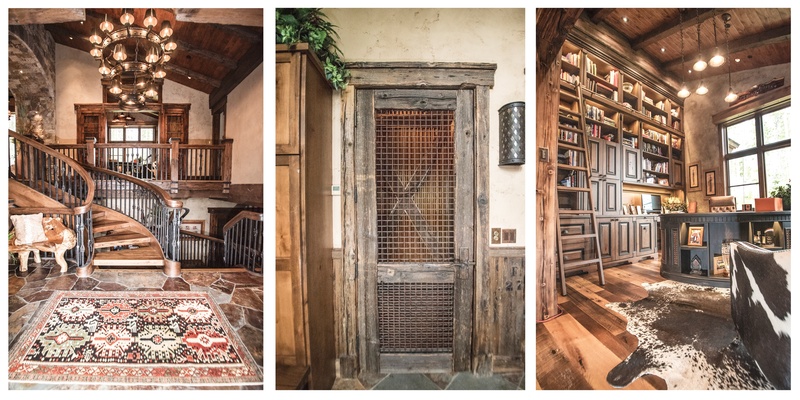 By using repurposed wood and designing an elevator that looks like an old-fashioned mine lift, the homeowners created a unique ambiance that demonstrates how to design a grandiose western home. With sweeping staircases, dark wood, and distinctive leather furniture, the Summit County homeowners clearly achieved the rustic elegance they were hoping for in terms of style and historical significance. If the furniture looks unique that’s because it was custom-designed by Steel Strike Leather Products out of Buena Vista. Founded in 1989, Steel Strike creates timeless hand-crafted leather and wood furnishings with an American West flair. In an effort to design the mountain home they’ve always wanted, the homeowners worked with Denver interior designer Dixie Niichel with Niichel Design. In terms of rugs, the homeowners chose two from The Scarab which are located in the great room and in the foyer. See all our images of this home in larger format in our lookbook.